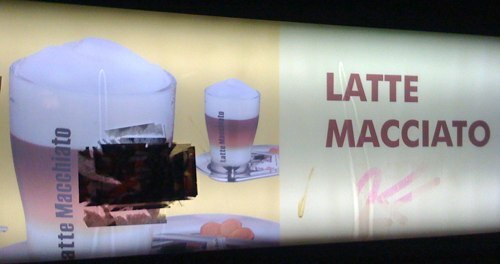 Latte Macciato oder Latte Macchiato? Manche Schreibfehler ließen sich vermeiden, wenn man nur vor dem Aufkleben von Buchstaben einmal die Augen aufmachen würde. Die Begründung für verschiedene Schreibweisen von Kaffee waren bereits Thema eines anderen Artikels. Daher wissen wir nun auch, dass “Kaffee” das Getränk, “Café” hingegen immer eine Örtlichkeit beschreibt. Vielen Dank an Matthias für den Link zum “Café to go”. Hey there! This is my first visit to your blog! We are a group of volunteers and starting a new project in a community in the same niche. Your blog provided us valuable information to work on. You have done a marvellous job! More ancestors ought to recite this and understand this aspect of the story. I cant believe you’re not further popular. Improving the overall performance on the sales department is a task for the sales manager who need to ensure that his personnel have every one of the essential tools to attain this aim. Productive selling skills and approaches are often being practiced by salesmen devoid of them realizing that their traditional sales strategies are proven systems that have an effect on their sales overall performance. I prefer the colours of the website, subdued, relaxing hues completely complement the particular feelings of your records! Not necessarily once, definitely not double, as i ended up being weightier day, We go through your old blogposts plus it generally much better this feelings! everytime i call at your blog i find at least one post which will interests me.your website never ceases to interact me. I see a little something truly special in that website. Today YouTube video lessons quality is more enhanced and enhanced, so thatís the cause that I am watching this video at here.